Children love to role play and given any opportunity to do so, my kids jump at it! Little kitchens are always a hit with children and these beauties from Plan Toys are no exception. 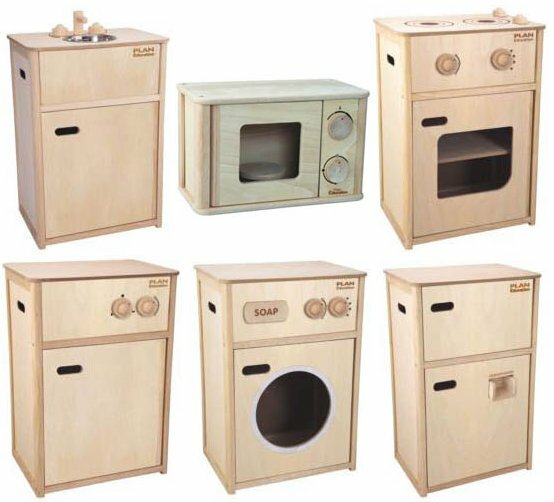 We’ve raved about Plan Toys before and here we go again thanks to their Large Scale Home Items with an enviable selection of white-goods (or should that be wood-goods?) for fitting out any junior chef’s pretend gourmet area. The collection consists of a kitchen sink, oven, fridge, dishwasher, washing machine and microwave. The attention to detail is perfect and benefits the children’s interactive play. So the fridge has the convenience of an ice-maker (I can only wish my grown-up fridge had one). The microwave has a rotating turntable; the washing machine even has a pull-out soap dispenser drawer. On top of that, nearly all ‘appliances’ have either knobs that turn, transparent windows or doors that open and close. There’s seriously hours of pretend cooking fun to be had! To purchase from the Plan Toys Large Scale Home range, visit Bébé. Prices start at $89.95 with delivery available across Australia.